What comes to mind with a theme like Circles is abstraction and geometry. Because I’m more attracted by figurative subjects than abstraction, I decided to choose the moon as my subject. Not easy to do something original, it has been represented so many times … and suddenly when I was in Beaujolais I found “the fabric” ! and immediately knew it will be my back ground fabric. My quilt is a landscape because I also like them, it represents a sleepless night … (full moon as a dramatic effect on my sleep ! ): a multiplication of the moon in my mind (the background fabric), me turning in circles in my bed (the quilting in the left part), BUT despite its nasty effects the moon is always seen as beautiful and romantic : full moon rising from the forest with a ribbon of mist. Material & techniques : silk, velvet, wool and painted organza for the tree trunks, acrylic paint, hand and free motion quilting with silver thread. The background fabric is cut in 2 pieces and used on both sides; the seam is hidden behind the misty line on the tree trunks. All the fabrics come from Malfroy Million, a manufacturer and silk designer from Lyon : go on their website www.malfroy-million.com : it is a dream ! Chantal I recognize the fabric!!! and the sleeping problems with full moon. Beautiful work. The horizontal lines of the mist complements the vertical lines of the trees. Very nice design. Moon, mist, trees…this piece has several of my favourite motifs! The quiet colour palate belies the power of that moon to interrupt your sleep. Beautiful interpretation! I love the way you tell your story, recognizing what you mean about sleepless nights and all the other effects the moon has on our lives and bio-rhythm. Great use of the different fabrics and using its prints. I thought that I recognised the fabric! A great interpretation of the moon and sleep patterns and a great result achieved working outside your comfort zone. I love the graphic quality in your colours for your design. This is the only quilt that didn’t jump out as being obviously yours. It has an ethereal quality and is quite beautiful. The mist and the moon work really well and the contrast of the trees is really great. the subtle colour palette is great. I have looked at this piece several times and it reminds me of my childhood, being in bed with the curtains blowing in the breeze and the moon shining through. The subdued color scheme works very well. I love the mix of patterns. I love the misty feel you have created in this piece—far from a typical full moon scene. The trees are beautiful and definitely hide the join. The mix of lines and circles is very effective. 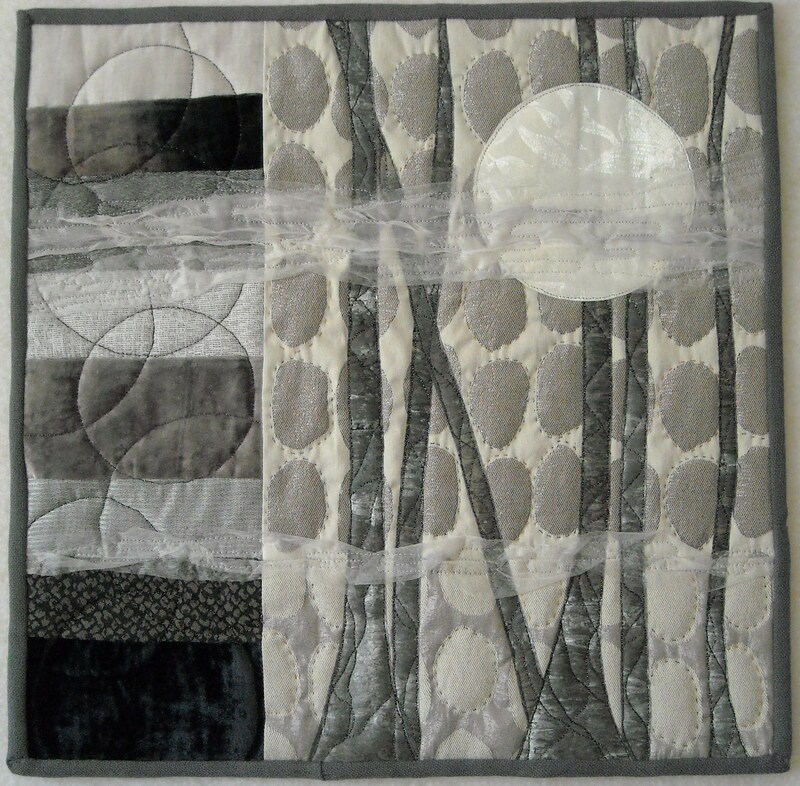 Using just grey tones and creating such a beautiful quilt. Bravo. I specially like the misty lines who keep the whole quilt together. Great to use both sides of the fabric.